The electrical energy is generated at the various power (or generating) stations viz. hydro-electric power plant, steam power plant and whichever which are located at the favorable places where water energy or fuel (coal etc.) is available in abundance. This generated power at the power stations has to be supplied to various consumers scattered at far off places. There is a large network of conductors between the power plants and consumers for this purpose. This network can be broadly divided into two parts namely transmission and distribution system. The system by which bulk power (or energy) is delivered from the power station to load centers (big sub-stations) is called transmission system of electrical power. In these articles, we shall deal with the various aspects of electric power transmission system. The generation, electric power transmission system and distribution of electric power is called power system. The single line diagram of the power system in India is shown in the figure below. The electric power is generated at the power station by 3-phase, 3-wire system employing the number of alternators in parallel. The generation voltages are 3.3, 11 or 33 kV however, the most usual value adopted in practice is 11 kV. At the power station, the generation voltage (11 kV) is stepped up to 132, 220 or 400 kV (i.e. whichever is economical) depending upon the distance; the amount of power to be transmitted and the system stability. The bulk of electrical power is transmitted from the generating station to the load centers (i.e. main sub-stations) by overhead lines at 132, 220 or 400 kV. This forms the primary electric power transmission system. For primary transmission 3-phase, 3-wire system is always employed and the aluminum conductors with steel reinforcement (A. C. S. R.) are run over the steel towers. On the outskirt of cities, there are substations where power is received at 132, 220 or 400kV and is stepped down to 66 or 33kV depending upon the amount of power to be fed to a particular area. Then the power is transmitted at 66 or 33kV by overhead lines. This constitutes the secondary electric power transmission system. Three-phase, 3 wire system is always employed. At suitable places near the city or load centers, there are substations where secondary transmission voltage is stepped down to 11 kV and the power is delivered at this voltage by overhead lines. This forms the primary distribution system. These 11kV lines are run along all the important road sides of the city and power is supplied to the bulk consumers (big industries) at this voltage. The bulk consumers install their own sub-station to step down the voltage to 400 V for utilization of electric power. Three-phase, three-wire system is invariably used. The electric power from primary distribution lines is delivered to various substations called distribution sub-stations. These sub-stations are located near the consumer’s localities. At these substations, voltage is stepped down to 400 V and the power is distributed by 3-phase, 4-wire system. This forms secondary distribution system. The voltage between any two phases (i.e. line voltage) is 400 V and the voltage between any one phase and neutral, i.e. phase voltage) is 230 V. The single-phase domestic loads (e.g. lamps, fans, refrigerators, heaters etc.) are connected between any one phase and neutral whereas industrial loads (e.g. 3-phase motors, furnaces etc.) are connected across 3-phase, 400 V lines. Thanks for reading about electrical power transmission system. 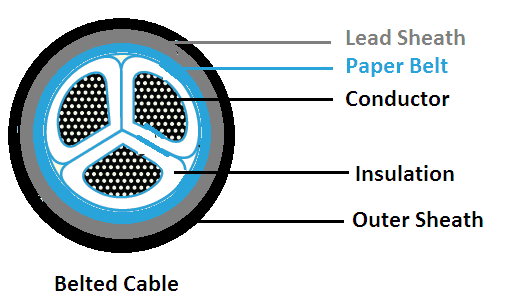 © https://yourelectricalguide.com/electric power transmission system.